Bold Japanese sencha tea, creatively entwined with toasted coconut and ginger to create a cone of a kind experience. The aroma of Rogue Wave from The White August Tea Company before and while infusing reminds me of coconut cookies! It’s a wonderful smell, indeed! The Green Tea is a powerful one and a tad on the grassier side of things but the coconut brings this to a whole new level! It’s sweet and tropical and nearly cookie-like it’s a unique taste and glad White August Tea has this one available! In addition, the ginger is noticeable but very nicely done. It meshes well with the coconut and green tea! This is a bold brew and I like it! This is very tasty both hot and cold! Ingredients: Black tea, rooibos, cacao nibs, coconut, apple, and vanilla flavoring. A unique blend of coconut scented black tea, smooth rooibos, cacao nibs, vanilla, and apple make Bountiful Black most pleasing to the palate. The flavor is rich and sumptuous. Trust us when we say you’ll enjoy every delightful sip. Tea Fact: Because Bountiful Black contains black tea, it also has caffeine. However, if you like the flavor of both black and rooibos tea you’re going to love these two blended together. First I want to say that the name of this company is pure genius! With the 2nd most popular (only to water) beverage world-wide being tea – we all know there are TEA ADDICTS out there…and two of them are right here at SororiTEA Sisters! Bountiful Black Tea from Tea Addiction is nice and sweet and smooth and dessert like! The Chocolate isn’t overly noticeable but this is darned tasty! The Coconut and Vanilla as well as the apple bits seems to play more of a part here – but I think this tea is just DANDY! 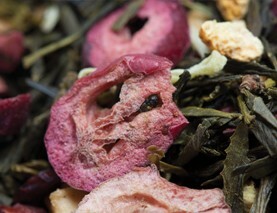 Awe-inspiring bai mu dan white tea, overflowing with strawberries, rose petals and creamy coconut. The perfect compliment to the perfect day. The smell of this is unique…it’s sort of hard to explain but I would try by saying the rose comes thru more than the other ingredients but you can tell there are other ingredients within this mix…something slightly fruity but not very identifiable based on aroma alone…I think that is because the coconut fragrance interrupts the fruit and the rose overpower both the coconut and the strawberry. But the aroma is lovely, regardless! The taste is really wonderful! The white tea flavor hits you and the strawberry is the prominent flavor on the tongue but it’s still somewhat mellow and isn’t tart at all! The rose comes thru a little too and the coconut takes the back seat but seems to step up to the plate a little more as it cools. What a beautiful, gently flavored, tasty White Tea! I really like this! It’s a great cup – both HOT and COLD!!! I’m a fan of Strawberry Cascade from White August Tea Company and I must say I haven’t met a White August Tea I haven’t liked so far! They have a wonderful selection and LOTS of tasty teas! They are quickly becoming a tea company suggest to many of my friends! Sweet and fruity with a dash of nutty flavour, this green tea is the saviour of elves everywhere. When they’re building to deadline in the workshop, they crave a drink that’s like dessert with a kick of energy. So we made a tea that tastes just like fruitcake in a mug. Add some brandy for the authentic cake experience – those tipsy elves always do. Sencha green tea, orange peel, apple, papaya, raisins, barberries, freeze-dried cranberries, coconut, natural flavouring. Yum!!! This is so tasty. One quick glance at the ingredient list might lead someone to believe that this is going to be a very fruity tea – and it is – but, it isn’t SO fruity that it overwhelms the flavor of the green tea. The green tea is light-bodied and light in flavor, but it adds a crisp, fresh taste to the fruit that is distinct. It isn’t very grassy or vegetative to taste; if you’re one that doesn’t care for green tea because it does come off as too grassy or vegetative, this is an excellent choice for you! There is a lot of different fruit tastes here. I can taste hints of each fruit, but the two that stand out the most definitively to me are the orange and the cranberry. There is also a certain “tropical-y” taste to this, like the Elves on holiday! It is sweet (almost candy like!) and there is a hint of tartness toward the end of the sip. Due to the sweetness of this cup, it is one that I recommend tasting before you add additional sweetener – you may find this one to be just right without it. It is sweet, fruity and delicious. A tea that I would recommend to anyone who enjoys flavored green teas – this one is one I could enjoy again and again! Love it! 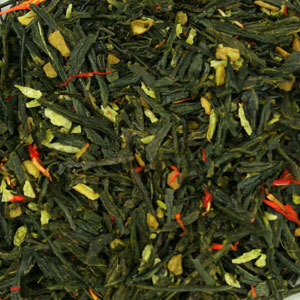 Bold Japanese sencha tea, creatively entwined with toasted coconut and ginger to create a one of a kind experience. This is my first experience with this tea company, and I’m happy to report that it is a positive one! This is an excellent tea. I must first mention the aroma because it is remarkable. As my teacup sits in front of me, the most amazing fragrance is wafting to my olfactory nerves that is divine and yet difficult to describe. It has a fresh, grassy smell that reminds me of a green meadow in early spring, and the sweet smell of coconut, mingling with a distinctive peppery note of ginger. These scents combine to create a rather unique and beautiful bouquet. The flavor is lovely! The Japanese Sencha base is sweet and grassy but not that bitter-grassy taste that some green teas possess. There is a smoothness to the tea also and a buttery quality that melds nicely with the flavor of the coconut. The coconut tastes authentic and I can even feel the slickness from the coconut on my tongue. It’s rather delightful! The ginger flavor does not stand out at the start of the cup, but as I continue to sip, I notice the peppery flavor begin to intensify, and is especially noticeable in the aftertaste. The tea finishes with the silky feeling of coconut gliding over the palate, and a slight kick of ginger just at the tail. It is just enough to keep my interest and make me want to take another sip. I really like this tea! The interplay between ginger, coconut and Sencha is absolutely delicious! Sweet, but not too sweet. Gently spiced. A smooth vegetative quality. A pleasing balance that I think any tea enthusiast would enjoy. A robust and full flavored black tea accented with exotic imperial spices. The bold concentrated character of this lush black tea lends itself well to the full notes of cardamom, ginger and clove. The sweet hint of tropical coconut fragrantly fills the cup, offering an inviting taste of paradise to savor from any spot on the map. Delicious with a splash of milk. A bright and flavorful steep. Sunglasses not included. 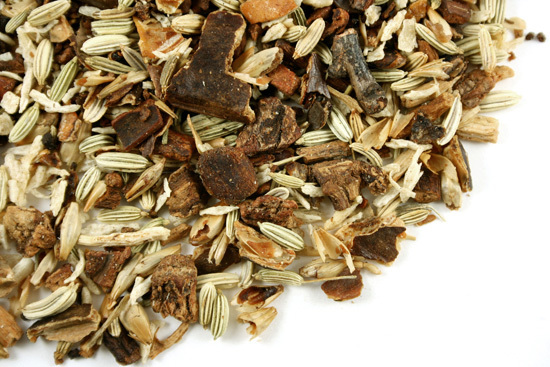 Ingredients: Indian black tea, organic cinnamon, ginger, cardamom pods, whole cloves, orange peels, nutmeg, org. black pepper, organic cinnamon essential oil, organic coconut flavor. I guess it’s no big secret – I love chai blends! Now, when I say “chai” – I am using the word to describe what those of us in the United States have come to know as “chai” – that is, a tea or tisane that is comprised of a combination of warming spices such as cinnamon, cloves, ginger and/or cardamom … just to name a few. 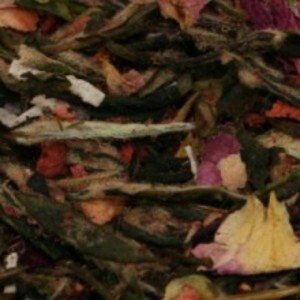 Some chai blends have fewer spices than those I just listed, some have many more. I think that’s one of the things that I find so intriguing about chai blends. I like the warm spiciness of it, and I like how the different variations of spices can lead to totally different tastes… some being more bold, some being lighter; some being more focused on one or two spice ingredients, and some being very even toned – so much so that it’s hard to tell where one spice ends and another begins. I have previously reviewed this chai blend, and I enjoy it now just as much as I enjoyed it then. It has a very pleasing spice level that is not too spicy and not too tame. The nutmeg is a nice addition and is a spice that I do not see very often in chai blends, but one that I think adds a nice dimension of flavor, especially to this blend, as it enhances the coconut flavor nicely. The orange is also a nice addition, and rounds out the tropical taste of this chai. A very nice, comforting chai and one of my favorite teas from Zhena’s!